Whether we’re talking about a tablet or a phone, a laptop or a music player, what matters most is the battery. And electric cars are no exception from this rule. The problem with new technologies is that there are no infrastructures to sustain them, which makes it unprofitable for the consumer, given that the lack of necessary tools to assure the function of new technologies makes it far from user friendly. It’s in this train of thought that the battery developer Phinergy and metal manufacturer Alcoa teamed up for the electric car user not to be left in the middle of nowhere with no possibility to plug it in in the halfway. 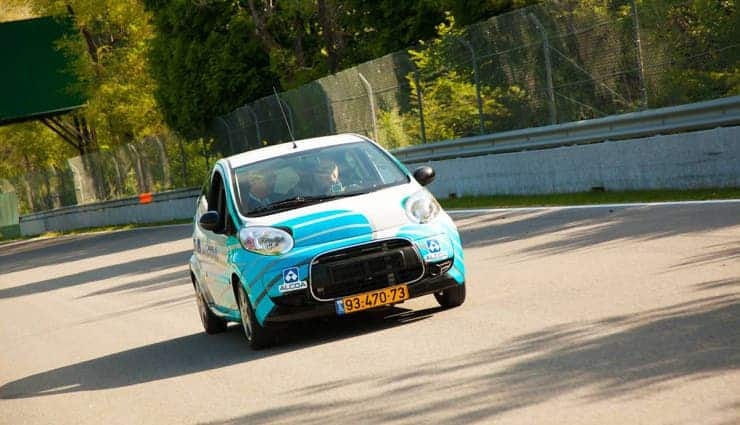 The modified Citroen C1 was showed during the latest conference in Montreal, with two batteries: one on lithium-ion and the other on aluminum-air. Combined, these two batteries allow the car more than a thousand miles of range. In the case of Citroen, the lithium-ion battery works as the main energy source – as in most electric vehicles – given that only the lithium-ion can take the driver far enough. In a Leaf there’s no need to recharge in 80 miles, and in S it’s almost 300 miles charging-free. But since most of the people in the USA need to travel more than 30 miles a day, the aluminum battery is what they need for their cars to work properly, serving as a ranger extender and letting the consumer drive a thousand carefree miles. Lighter than lithium-ion batteries, the aluminum-air ones are more energy dense as well. Not great as a primary energy source in a car because you can’t charge them at home, they’re perfect to swapped out at a specialized service station when they’re drained. The car will also rely on the rechargeable lithium-ion battery and automatically switch to aluminum-air when needed to. And because most of the trips are under 35 miles, the aluminum battery won’t be used on a daily basis. Alcoa estimates that the aluminum battery will be run down once a year. If there’s a chance for the companies to make the range extender affordable, a lot more electric cars will be on the roads and less anxiety because of the users’ concerns.